Fourteen year old Grace doesn’t know it yet, but she’s been around for three thousand years waiting to fulfill her destiny to become one of the Three Graces of Greek Mythology. Forces are battling for her love, her body and her destiny. Now all she needs to do is survive the war. Good pacing and characters combined with an appealing fantasy adventure. This two-part young adult fantasy novel features a well-paced adventure with an appealing heroine in Grace Severin. Grace is a not-so-ordinary Grade 10 student in Calgary who meets the very attractive young musician, Ben Butler, and is drawn to him in ways she cannot understand. Her love life is complicated by school bad-boy Josh, some brushes with danger and the attentions – both benevolent and malevolent – of the residents of Mount Olympus. The author’s experience as a teacher is reflected in the well-drawn portrayal of high school life and the authentic dialogue – her teenagers spring to life on each page. This is a story that will appeal to a female young adult audience. You can order a print book from your local book retailer, Amazon, or Createspace. You can download an ebook here on Smashwords to read on your computer, Kindle, Nook, Kobo, or Apple product. 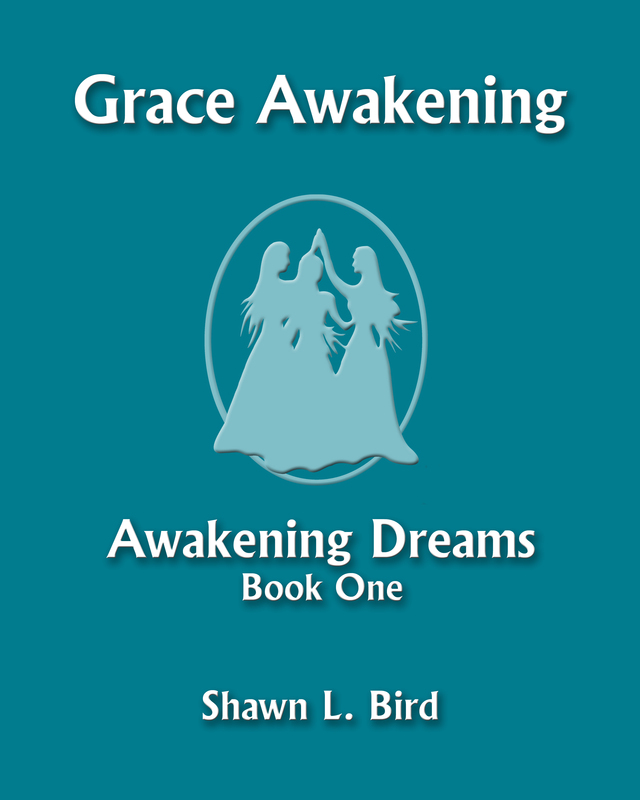 Enjoy both Grace Awakening Dreams and Grace Awakening Power in one volume. 6X9. 408 p.
Check out the reviews here and the press here! In Awakening Dreams, Grace discovers the devotion of a love that has followed her through time. She also discovers the evil forces that are determined to destroy her life in Calgary. As she faces attacks and begins to find her own strength, Grace awakens to the other reality that her dreams reveal. In Awakening Power, Grace has been sent to the Shuswap and must learn to live without her love’s physical presence in her life. As the attacks increase, Grace faces a battle to accept her destiny and to save the man she loves, their life together, and the joy, beauty and radiance that fuel all artistic endeavours in the world. Have your e-book of Grace Awakening autographed with a personal inscription! Click the logo to get a personalized pdf for your e-book or computer. Postage in Canada is expensive and Grace Awakening Dreams and Power is a large book, so it is costly to mail. When you order off my website or through Amazon, I don’t see the physical book. If you want your copy autographed you have to wait for a chance to meet me (I’m open to invitations!) or you can request a bookplate that I will sign for you, and you can stick it into your book. A bookplate is free. Please send an email with your full address through the contact form on this page. If you want a name on the bookplate, please spell it clearly. You are invited to join the Grace Awakening Facebook group to follow the latest information about the publishing process. You may also like to read the Grace Awakening themed blogs. Your book sounds amazing. Congrats on getting published. Thanks Heather! Keep your eyes on Amazon. Time is flying toward publication date! Grace Awakening is the next step for Twilight fans. There are several levels, from simple escape to complex allusion, poetry, and syntax. Teachers will find multiple stepping stones for differentiated learning. This book is one of the most compelling, teachable YA novels I have read, and I have read voraciously. I most like that I can recognize these various characters in my own students, and I love the familiar Canadian and Pacific Northwest setting. Shawn’s use of our landscape as a secondary home to the Greek gods is inspired. She finds and creates layers of meaning, filling them with sweetness to create good literary baklava! I am very excited that she is continuing the tradition in Grace Beguiling, which promises even more! I like your use of this section of the painting for Grace. You can go to the wideshot for Beguiling. Can you use it for cover art? If not, get a student to do a “in the manner of” representation. I also look forward to Grace Charming, or whatever C word you find appropo. There are so many wonderful stories of inspired love in literary tradition. Heloise and Abelard? If you keep moving from Greece to Italy up into France, or was it Gaul then? I am very excited in the meantime to learn about Petrach and Laure from someone who will do all the legwork and serve it up in a lovely novel for me! Yes, Heloise and Abelard are on my list to consider in the future, although their story is a little too close to Petrarcha and Laure for my liking. Who am I? Someone who does not read fantasy. When I read a book I want to believe it is real and fantasy does not do that for me. Grace Awakening is an exception. Maybe it was the setting I could relate to (BC! ), or the authentic characters; I’m not sure what it was but I was able to suspend my disbelief and immerse myself in Grace’s world. It was a pleasure to read! That’s high praise coming from you, Vivian. I appreciate it. I appreciate your frankness. We had a poll with several designs and the two that tied are the two shown for the two books on the webpage. The colour and dimensional image are quite fantastic on glossy paper, but I have wondered if it translates well enough to thumbnail. Thanks again. Wow that story about Grace sounds so cool! I always have been a huge fan of Greek mythology! Thanks! If you aren’t able to purchase it, do put in a request with your local public library! That’s a great idea, will do! Grace Awakening sounds like a lovely novel, Shawn. Heading to take a closer look! I hope you enjoy it, Cara! I shared this on Facebook!!!!! How wonderful!